Cleethorpes AC awarded the England Athletics Club of the Year Award 2016 for the Yorkshire and Humber Region. The award was presented at a ceremony held at the Gomersal Park Hotel, Leeds, on Tuesday 27th September. Committee members Ben Frary, Darren Rowe and Colin Smith were present to accept the award on behalf of the club along with Helen Smith. 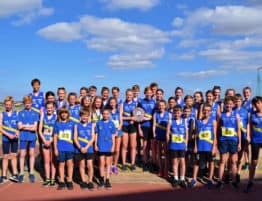 “This has been a fantastic year for the club and this award recognised all the hard work that goes into the sport by the club members, especially all the volunteer coaches, officials and committee members. We have seen the development of our U11’s 365 Fundamentals Academy, a satellite club with Linkage Community Trust and the club has grown to nearly 400 members. 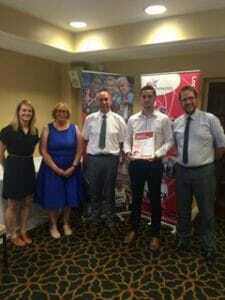 Noteable winners were the Yorkshire and District Athletics League who won Project of the Year. The league has grown year on year and give clubs the chance to compete against each other in a league format. 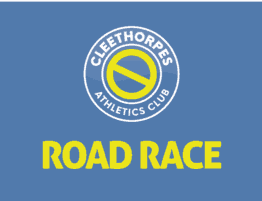 Cleethorpes AC are members of the league and have won the Premier Division each year since the leagues initiation four years ago. Malcolm Brooks, Kingston Upon Hull, won Official of the Year. Malcolm has officiated at local, national and international competitions for a number of years as a timekeeper and has trained and mentored many officials including many from Cleethorpes AC. Lesley Eldridge was award with the Services to Athletics Award. 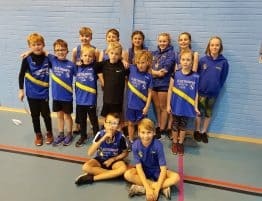 Lesley has been a stalwart for Athletics in Humberside region for a number of years and is heavily involved in the running and organisation of the Humberside Schools Athletics competitions and teams. She is an official at many competitions and also finds time to compete in the Javelin. 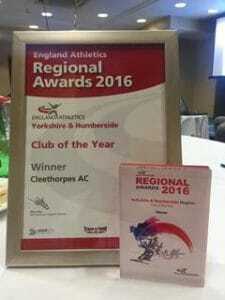 Congratulations to all winners on the evening and to all Cleethorpes AC members on the Club of the Year Award.